Since proclaiming “Brazil Impeachment: Workers Have No Side” (Workers Vanguard, 6 May), the Spartacist League and its International Communist League (SL/ICL) have been on a tear launching tirades against the Internationalist Group and our comrades of the Liga Quarta-Internacionalista do Brasil, sections of the League for the Fourth International. The accusation is that by opposing impeachment the IG, LQB and LFI supposedly support the popular-front government of President Dilma Rousseff of the PT (Workers Party), who has since been suspended from office by the gang of thieves in Brazil’s Congress. How to explain, then, that the headline of the article in the LQB’s Vanguarda Operária said emphatically, “No to Impeachment! For Workers Mobilization against the Rightist Bourgeois Offensive – No Political Support to the Bourgeois Popular Front Government” (The Internationalist, April 2016)? Easy, the SL/ICL just lops off the last two-thirds of our headline. In fact, while for the last 13 years the bulk of the Brazilian left tailed after the PT-led government, the LQB and LFI have from the outset uniquely stood for proletarian opposition to the class-collaborationist popular front, in which the workers organizations are chained to capitalist “allies.” We continue to do so today when virtually the entire Brazilian left is lined up with one or the other of the contending capitalist forces. (See “Brazil’s Opportunist Left Tailing After the Bourgeois Blocs,” The Internationalist, April 2016.) The SL/ICL simply asserts that opposing the power grab by hard-line capitalist forces ipso facto means taking the side of one bourgeois force in parliament against another, and hence Brazilian workers should … do nothing. The class struggle never intrudes on the blinkered vision of these paladins of abstentionist neutrality. As we wrote previously, the ICL hadn’t written about Brazil for over a decade, and its only interest in the country, the largest in Latin America, has been to smear the LFI and to cover up its betrayal of our Brazilian comrades, deserting them at the height of a key class battle there 20 years ago. Its sudden interest in matters Brazilian is clearly intended to counteract the impact of the powerful documents and statements of the BLTN Faction and Italian comrades, and divert attention from SL/ICL’s shameful actions towards them as well. The special supplement of The Internationalist distributed at the L.O. Fête noted that the comrades in Italy were driven out in what an ICL International Control Commission itself called a “bureaucratic witchhunt” by the central leadership of the ICL, based on “gross exaggerations or outright falsifications” of their political views and the work of the Italian section, in which “these comrades were treated with contempt and hostility” amid grotesque accusations of faking illness (cancer). The 2004 ICC investigation of the earlier 2001 ICC investigation concluded that “the damage done to the ICL by the bureaucratic abuse” was “irreversible.” In consequence, the ICL never informed the targets of this abuse that the earlier charges and verdict against them had been found to be entirely false. And that was 12 years ago – talk about guilty silence! It was only when they contacted the LFI that these courageous comrades could read the ICL’s confession. No bonapartist threat in Brazil? Demonstrators in Curitiba, headquarters of the Lava Jato (Car Wash) judicial/police investigation, call in December for mililtary intervention. So what about WV’s “arguments” on Brazil impeachment? It only has one, that by (its) definition, opposition to impeachment is ipso facto support for the government. In the ICL’s idealist world of binary categories, if you oppose x you therefore support y. This implies that there is no alternative, that you cannot oppose the seizure of power by hardline anti-working-class reactionaries without thereby supporting the popular-front government in office. Why not? Because these pseudo-Marxists restrict themselves to the parliamentary sphere. They equate opposition to impeachment – in which a thoroughly corrupt Congress (two-thirds of whose members are under investigation for bribery or crimes of violence) ousts a government elected by 54 million votes – with a vote of confidence in Dilma Rousseff and her PT-led government. We explained previously (in “SL/ICL Impeached By Its Own Past”) that “the anti-democratic drive for impeachment is the spearhead of an attack whose real target is the working class and the oppressed population of Brazil. All of this is of no interest to the SL/ICL which – unsurprisingly – presents no program for class struggle in Brazil.” After earlier portraying impeachment as a reaction to the “widespread corruption scandal rocking the country,” WV now admits that there are “growing forces of right-wing reaction aimed at the working class, the poor and the oppressed.” So what is the ICL’s program to fight those forces? It still presents none. Its entire “program” is to abstain on the question of impeachment. As those forces seized power, the ICL called to do nothing. For our part, the LQB and LFI have been quite clear in rejecting the claims by supporters of the (now former) PT-led government that impeachment amounted to a coup d’état. But we pointed out that in Brazil today the drive toward a bonapartist “strong state,” which the working class must steadfastly oppose, does not require a military overthrow of the existing political regime. WV (20 May) now ridicules our “‘explanation of the mounting dangers of an authoritarian regime being installed without a coup d’état’ – i.e., through a vote in Congress.” Actually, that’s not the only way it could happen: there’s also the possibility of action by the courts, both the Supreme Court and the Superior Electoral Court. But even if it were by a parliamentary vote, don’t forget that Hitler’s Nazis came to power not through a military overthrow but by a presidential appointment and an enabling act voted by the Reichstag. WV (6 May) writes that “the IG/LQB cynically rants about ‘bonapartism’.” The authoritarian danger in Brazil is hardly abstract. We detailed this in our article “For Class Struggle Against the Bonapartist Threat in Brazil” (published in The Internationalist No. 43, May-June 2016). One would have to be blind not to see the sinister forces behind the rightist mobilizations for impeachment – the blatant participation by Military Police and Federal Police, the calls for military intervention, the dominance of racist ultra-rightists. We also spelled out “The Role of Imperialism and the Military in the Brazilian Political Crisis” (The Internationalist, April 2016) including the top commander saying “the army could be called upon to intervene,” and the judge leading the Operation Car Wash (Lava Jato) “investigation” working closely with the U.S. Department of Justice and FBI. None of this is alluded to by the ICL. Their articles are not at all intended to explain events in Brazil, much less to indicate a path for struggle. Their sole purpose has been to try – however clumsily and dishonestly – to fend off the impact of the devastating political exposure by its own former comrades of the ICL’s zigzag flight from Trotskyism. No bonapartist threat in Brazil? 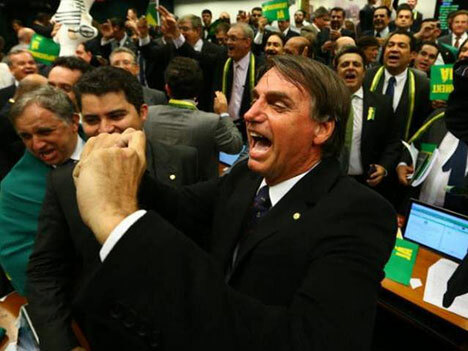 Social Christian deputy Jair Messias Bolsonaro dedicating his vote in Congress for impeachment to the commander of the secret police responsible for the torture of ousted Brazilian president Rousseff under the military regime that ruled from 1964 to 1985. Bolsonaro, a former paratrooper, has praised the dictatorship, justified torture and is pushing his brother’s bill to outlaw communism. The escalation of police repression was prepared by the popular-front government of Luis Inácio Lula da Silva and his hand-picked successor Dilma Rousseff, which the LQB has repeatedly denounced (see our article “Lula’s Brazil: Land of Massacres,” in The Internationalist No. 22, September-October 2005, or “Brazil: No to the World Cup of Repression!” in The Internationalist No. 37, May-June 2014). 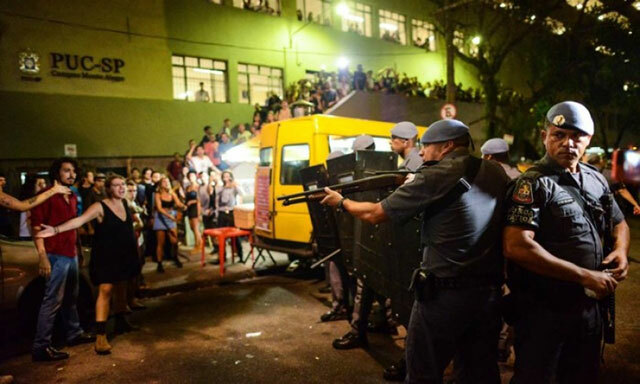 WV, meanwhile, was silent on this – or any other aspect of the class struggle in Brazil – for the past decade. It only raises this now to belittle the heightened danger, and to attack the LFI while seeking to cover up the ICL’s criminal desertion from the struggle waged by the LQB comrades to oust the police from the unions (see our Dossier: Class Struggle and Repression in Volta, Redonda, February 1997; and Dossier: Responses to the ICL Smear Campaign Against Brazilian Trotskyists, May 2010). –and ending with a call for “proletarian opposition against the bourgeois right wing and the bourgeois popular front in power, no vote for any party in such a political alliance of class collaboration”; break with the PT and all the bourgeois workers parties and forge the nucleus of a revolutionary workers party. Workers Vanguard snorts that “the IG/LQB throws around calls for factory occupations and a general strike, even claiming to politically oppose the government,” pooh-poohing this as the “IG/LQB’s bluster about workers mobilizations.” Aside from the fact that WV makes no call at all for workers action, and instead appeals for inaction, there is a kind of perverse anti-Marxist logic behind its dismissive response. Given the ICL’s thesis of a supposed qualitative regression in workers’ consciousness globally, such sharp class struggle challenging capitalist rule must be impossible, and therefore calls for it are phony. Q.E.D. Trouble is, nobody bothered to inform Brazilian and other workers facing capitalist attack. Such workers’ struggles are quite possible – the key missing element is revolutionary leadership. But they won’t get it from the ICL. 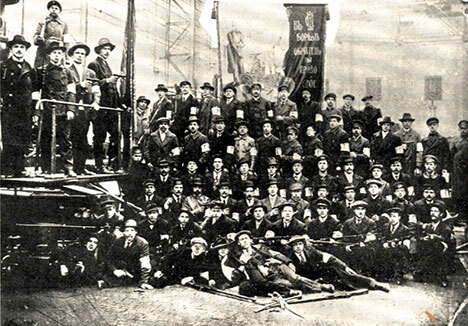 In emphasizing that the drive for impeachment and mobilization of the repressive forces were aimed at ramming through a raft of anti-working-class measures that the PT-led government had been only partly successful in legislating due to worker resistance, the LQB’s Vanguarda Operária noted: “There are contradictions which revolutionaries can make use of between the working-class base of the union federations and bourgeois workers parties on the one hand, and the tops in the popular-front government.” Explaining that these “labor lieutenants of capital” are an obstacle to a genuine workers offensive against the bosses, the LQB put forward the above program of demands as a means to intersect those contradictions. Actually, we explained that while “many pseudo-Trotskyists have deliberately misinterpreted the policy of Lenin and Trotsky at that moment, claiming that the Bolsheviks politically ‘defended’ the Kerensky government,” thus justifying their support to the PT government in Brazil, in fact the lesson is that one can make a bloc in action against a vital threat to the interests of the workers without giving political support. According to the ICL, this lesson is invalidated because of the absence of “an actual military coup.” Yet we were quoting from Trotsky’s 1932 pamphlet What Next? Vital Questions for the German Proletariat in which he cited the Kornilov-Kerensky precedent in outlining how to fight the rising threat of fascism. Was there a coup under way or in the offing in Germany at the time? Not at all. Was there a bonapartist danger? Very much so. “Even at the present time, we are not duty-bound to support the Kerensky government. That would be unprincipled. It is asked: then we are not to fight against Kornilov? Of course we are. But that is not one and the same thing…. As Trotsky emphasized in the last-cited article, “For Marxists, the question is not decided by a quotation, but by means of the correct method. If one is guided by correct methods, it is not hard also to find suitable quotations.” For those befuddled by the WV’s obfuscations on Brazil, Trotsky’s German writings of 1931-32 are worth studying, for they directly refute the position of the ex-Trotskyist ICL today. In particular, Trotsky addressed the question of the 1931 so-called “Red Referendum” in Germany. In actuality, this was a referendum called by rightist nationalist forces (the “national liberal” German People’s Party and the far-right German National People’s Party) and then backed by Hitler’s National Socialists to unseat the Social Democratic-led coalition government of Prussia by dissolving the state legislature in order to hold new elections. 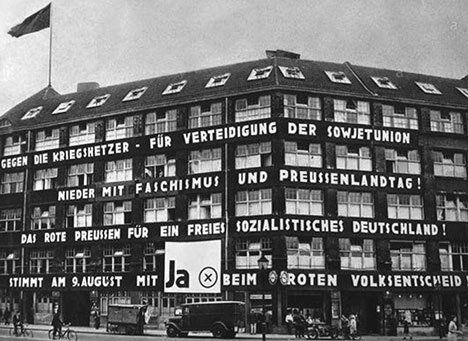 On orders from Stalin, the German Communist Party supported the referendum. This does not imply that the right-wing parties pushing the authoritarian backlash in Brazil today are “the same as Hitler,” or that Brazil is “on the verge of fascism,” as the pro-PT Brazilian left claims and the ICL falsely imputes to us. What it underscores is that Trotsky’s argument and methodology are completely incompatible with the ICL’s claim that opposing the rightist impeachment drive equals supporting the Rousseff government. In Brazil, both the right-wing opposition (now in office) and the popular-front government (then in office) are capitalist, says the ICL, so what’s the big deal? Why the IG’s “own Brazilian comrades” portray this “as a ‘dispute between two bourgeois forces’ that ‘share the same fundamental program of resolving the capitalist economic crisis by attacking the working people’.” Indeed, but what the LQB went on to say, in the last part of the sentence that WV conveniently omitted, is that those forces “may differ (at times) only over the rhythm and degree of the attacks.” And those differences are significant from the standpoint of the working class which, unlike the professional abstentionists of the ICL, will have to face the consequences. Indeed, the consequences are already being felt. Not that today’s ICL gives a damn. So WV argues that “If they [the LQB] had a representative in the Brazilian Congress, that would mean voting ‘no,’ i.e.. a vote to keep the head of the popular front in office.” It then cites the case of a 1964 vote by Sri Lankan Trotskyist leader Edmund Samarakkody that brought down the popular-front government of Sirimavo Bandaranaike, a vote which Samarakkody later renounced as a “serious mistake.” The pundits of the latter-day ICL cry foul when we explain that opposing impeachment in Brazil is not at all contradictory to upholding the vote that brought down the Lankan government, which WV notes was “a position that IG leader Jan Norden powerfully defended a few decades ago when he was a leading member of our tendency.”2 Samarakkody cast a parliamentary vote of no confidence against the government, which was a correct and principled step. The Brazil impeachment vote was on a move by a parliamentary den of thieves to replace the elected president with a virulently hard-line anti-working-class regime headed by her former vice president as the spearhead of a capitalist/bonapartist offensive. In the first place, opposing impeachment cannot be reduced to a vote in Congress by a hypothetical LQB legislator, except in the minds of parliamentary cretinists like the ICL. The battle is being waged in the streets. 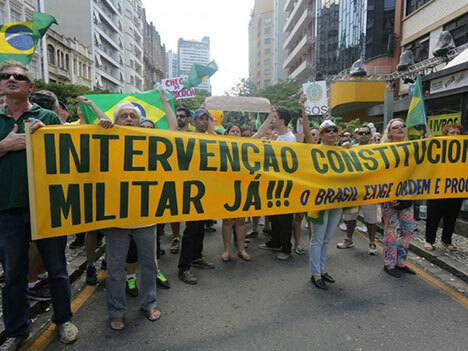 There were a number of national anti-impeachment demonstrations of up to half a million protesters prior to the May 12 vote to oust Rousseff. Several of these were attacked by the police, who ostentatiously support the ultra-rightist-led pro-impeachment mobilizations. According to almost every account, a large part of the demonstrators opposing impeachment, even a majority, also opposed the discredited Lula/Dilma government on almost every issue. But they were quite aware of the clear and present danger represented by that Congressional plotters (and their judiciary/police allies). Even so, we vigilantly distinguish our Trotskyist political opposition to both competing bourgeois forces from the stance of supporters of the popular front. Moreover, there are a number of tactics one could use inside and outside parliament. One could filibuster for hours attacking the government while opposing the impeachment ploy of the right wing. One could seize the tribune and attempt to stop the proceedings, which Mexican legislators do with some frequency. One could denounce the Congressional den of thieves and be dragged from the chamber. One could surround parliament with thousands of workers to prevent legislators from voting, as the Mexican Social Security workers did in 2004,3 and teachers did in 2013, first at the Chamber of Deputies and then the Senate, forcing legislators to carry out their vote approving the corporate educational “reform” in a Banamex (Citibank) convention center.4 Or one could invade parliament with hundreds of workers and bust up the proceedings, as a left-wing landless workers group Brazil did in 2006. Of course, the ICL, which holds that you can’t boycott elections except on the eve of an armed insurrection,5 would never dream of using such tactics. According to historian Louis Sinclair (Trotsky: A Bibliography), the speech6 was written by Trotsky himself. But in its eagerness to find ever new ways to revise and reject the positions of Trotsky (and Lenin) on issues ranging from the demand for a constituent assembly to running candidates for executive offices to the failed German revolution of 1923, maybe we will hear from the ICL that Seipold was wrong to vote against the 1931 Prussian referendum and he should have instead abstained. Behind the ICL’s passive neutrality in the face of the capitalist attack on Brazilian workers that is driving impeachment and the bonapartist judiciary/police offensive is its blindness to the actual content of these developments in the class struggle. With its idealist outlook, it only sees categories abstracted from their social reality – and not just in Brazil. The ICL claims that corporatist “unions” in Mexico are real unions, refusing to understand that these are labor cops of the capitalist state to prevent the rise of genuine unions, and in the case of the teachers “union” spearheading government attacks on the workers (while killing over 150 of its members). The ICL called for a “no” vote in the July 2015 Greek referendum based solely on the words on paper, covering up (along with the rest of the Greek left) the swindle by the SYRIZA government and aiding Greek premier Tsipras in pushing through the vicious austerity he had already agreed to. Behind this methodology is the ICL’s deliberate decision to exit the class struggle. It justified this with its claims (crystallized around the 1996-98 expulsions of the cadres who went on to found the LFI) that in the wake of counterrevolution in the Soviet Union and East Europe, workers’ struggles no longer had any connection with the final socialist goal. It then elaborated the thesis that the consciousness of the world proletariat had suffered a qualitative regression. These sweeping assertions not only masked marked regional differences, they were the “theoretical” underpinning of the ICL’s claim that Trotsky’s thesis that the crisis of humanity is reduced to the crisis of the revolutionary leadership – the central justification for the founding of the Fourth International – was outdated. This is also the ICL’s doctrinal basis for its criminal desertion at the crucial moment from the sharp struggle by the Brazilian comrades to oust the police from the municipal workers union in the steel city of Volta Redonda, which an ICL envoy explained by saying it was necessary to “pull our hands out of the boiling water.” Today WV reasserts this shameful declaration, saying: “Keeping their ‘hands in the boiling water’ in Brazil has so poached the IG/LQB’s brains that they can’t tell the difference between supporting and opposing the class rule of the bourgeoisie.” How totally cute – and totally cynical, repeating the ICL’s line as it stabbed in the back a struggle it originally hailed and encouraged. The ICL’s idea of opposing capitalist rule is to sit on its hands and tell Brazilian workers they “have no side” in the face of the offensive by hard-line capitalist reaction against the working class. Its sneering dismissal of intervention in the class struggle is testimony to the fact that it is the ICL’s consciousness that has suffered a qualitative regression, from Brazil to Mexico to Greece and beyond. Notably there was the ICL’s abandonment of the call to defeat U.S. imperialism in response to the 11 September 2001 attacks on the NYC World Trade Center and the Pentagon. Don’t forget its year-long silence on the U.S.-engineered 2009 coup ousting the president of Honduras. And then there is the ICL’s confessed social-imperialist support to the 2010 U.S. invasion of Haiti. In all these cases, its revisionism is justified with arguments about the supposed impossibility of militant class struggle, and is in the service of its “own” imperialist bourgeois rulers. Unsurprisingly, over Brazil the SL/ICL never mentions how the U.S. is working hand-in-glove with the “anti-corruption” investigation pushing for greater “opening” of Brazilian oil to the imperialist monopolies. 1. See “SL/ICL: Haunted by Revolutionary Trotskyism,” The Internationalist special supplement, May 2016. 2. See Jan Norden and Jim Robertson, “No ‘Critical Support’ to Popular Frontism,” in the Internationalist Group Class Readings on The Popular Front: Roadblock to Revolution (2007). 3. 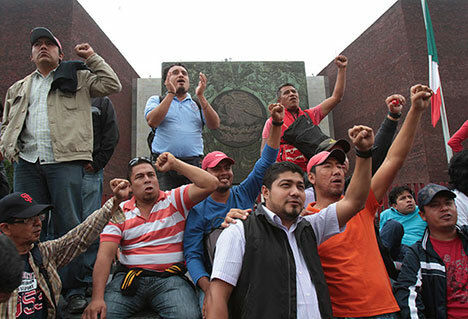 See “The Mexican Working Class Is Fighting Back,” The Internationalist No. 20, January-February 2005. 4. See “Mexican Powder Keg,” The Internationalist, August 2013. 5. See “Mexico: Grupo Espartaquista Boycotts the Class Struggle,” The Internationalist, March 2016. 6. The Seipold speech can be read in German at the site Sozialistische Klassiker 2.0, and an English translation was published by the American Trotskyists in The Militant (29 August 1931), also available on-line.